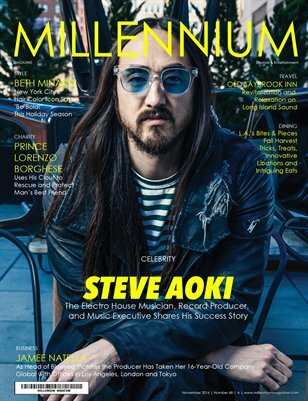 From working as a kitchen prep in his father's restaurant to becoming the number one selling DJ in the world, the Grammy-nominated Steve Aoki shares with Millennium Magazine how not working for the family-owned Benihana Restaurant empire lead to his successful record company, clothing line, and medical research foundation. Words by Lauren Clarke-Bennet & Taylor Bennett. Photography by Contarsy-Karecha for Highmark Studios. Video by Jonas B Productions. Grooming by Serpil Kurt with Assistant Sarkis Delimelkon. Wardobe provided by Dim Mak and John Varvatos. Shoot Location: Penthouse at Smyth Hotel, Tribeca, NY.